Michael Love and Associates, Inc.
MLA is a small company founded in 1999 specializing in water resources engineering and environmental analysis within the areas of stream and estuary restoration, passage and protection of fish and other aquatic organisms, river hydraulics, watershed hydrology, and fluvial geomorphology. 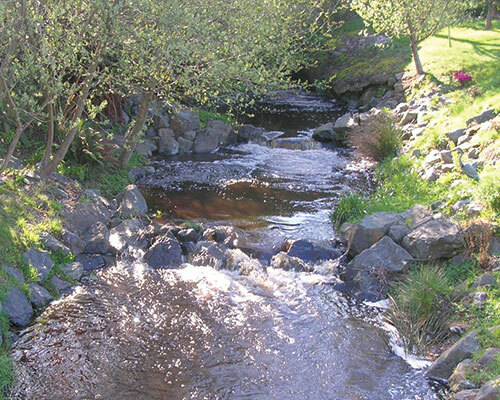 MLA is also a leader in developing tools and resources for providing guidance in the practice of fish passage and stream restoration. 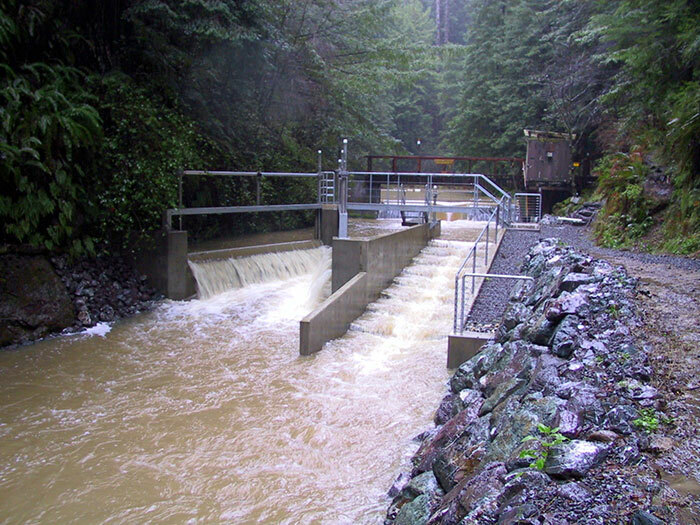 A unique and award winning Vortex Weir Fishway proved to be an effective solution for providing fish passage over a steep grade while conveying large flows and debris. 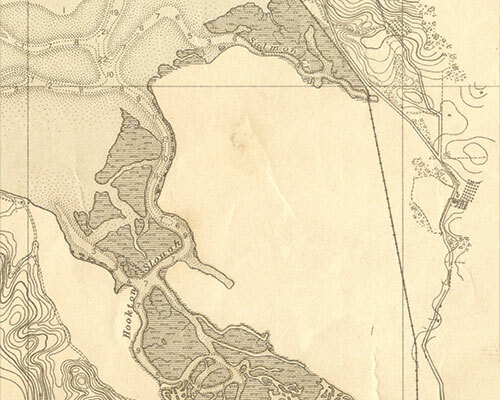 Creating a muted tidal system and constructing new slough channels, salt marsh, and backwater habitats behind existing levees to establish a functioning estuary. 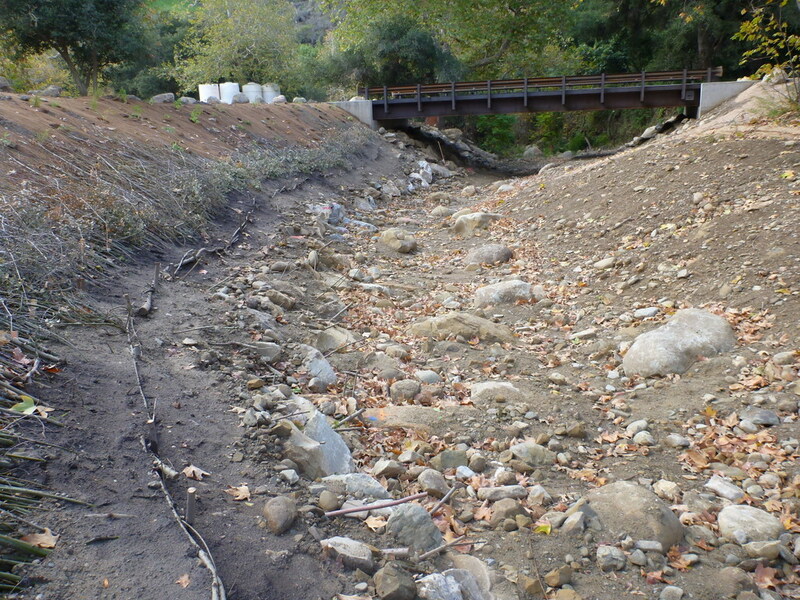 Replacing a perched low-water ford and restoring an aggraded upstream channel using bioengineering bank stabilization techniques along a tight meander. 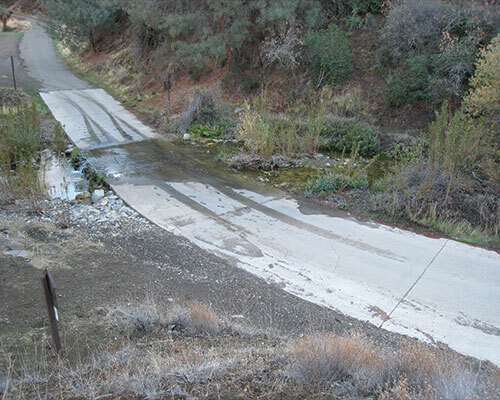 A geomorphic and fish passage assessment of Gaviota Creek adjacent to Highway 101 characterizes channel incision due to channel realignments and describes effect of existing concrete drop structures on the native fisheries. 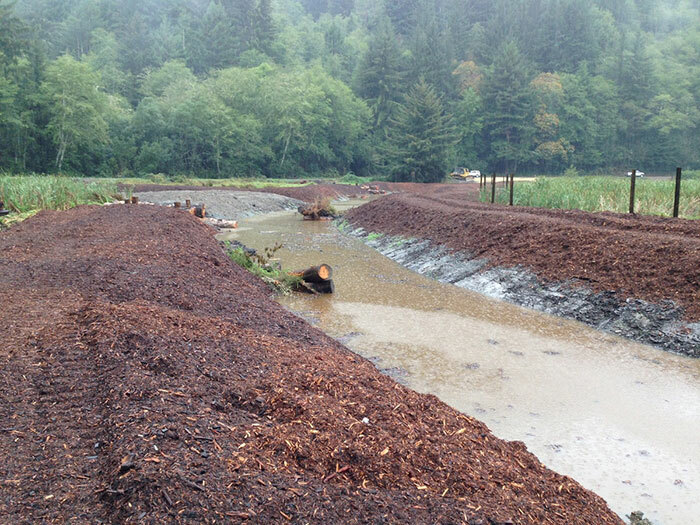 Restoring fish access for coho salmon to this large slough at the mouth of California’s only major undammed river. 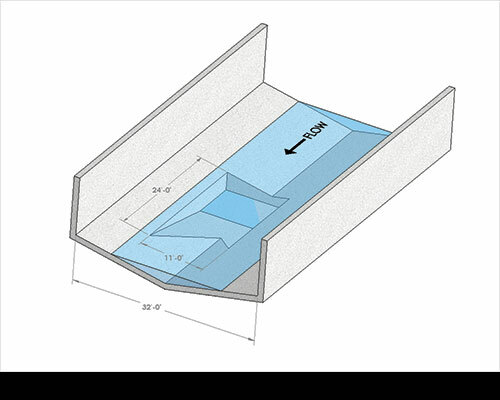 Testing a new weir shape for pool and chute fishways, using a 1:15 scale model to derive Chezy coefficients based on fishway flow and slope. 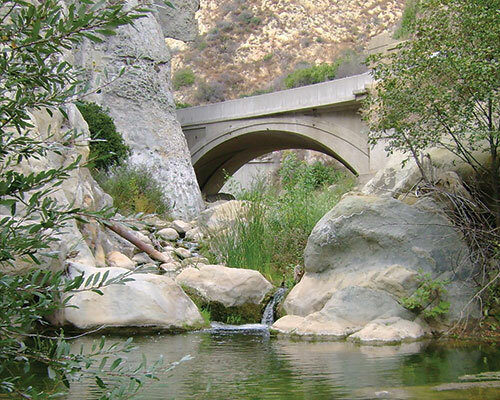 Horse Creek Dam, Sisquoc River, Los Padres National Forest, CA. 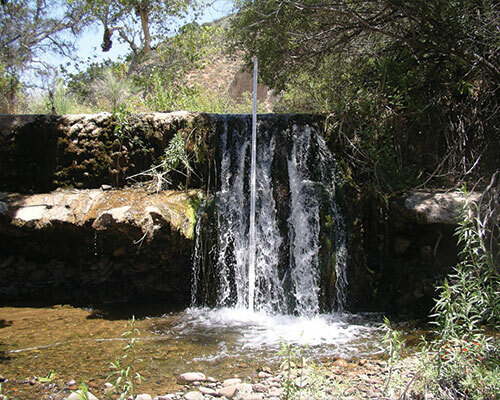 Geomorphic and engineering studies supported removal of this small dam, which blocked southern steelhead from accessing this wilderness stream in a remote corner of Central California. 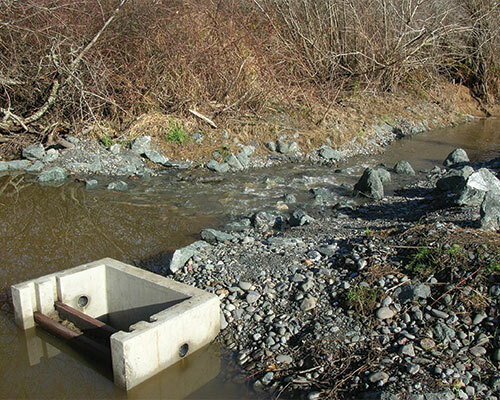 Roughened channel provides fish passage over an abandoned dam and into an impounded wetland that provides juvenile coho rearing habitat. Condensing projects to their useful essence, and emphasizing the application of general principles, the means used to address unique site conditions, and the lessons learned. 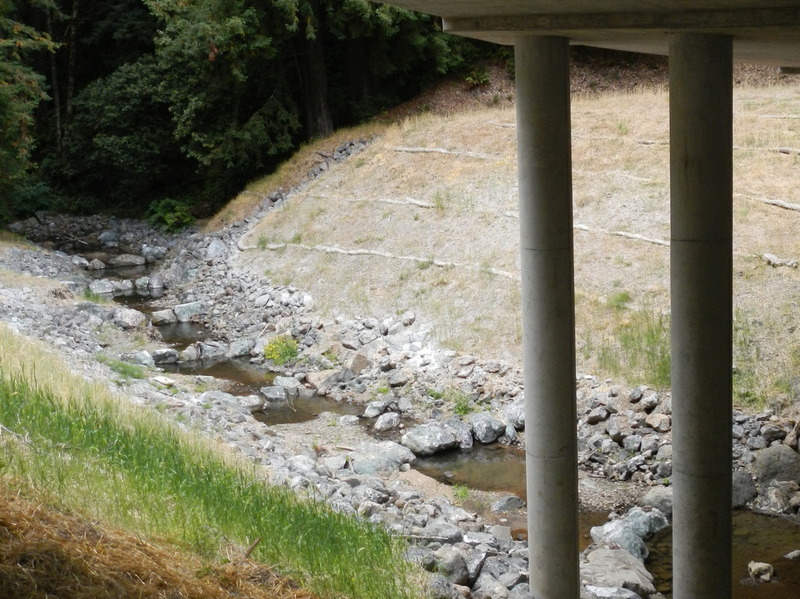 Providing design refinements and daily construction oversight for Caltrans to build 11 boulder weirs during the bridge replacement project, thus protecting upstream coho habitat from channel incision. 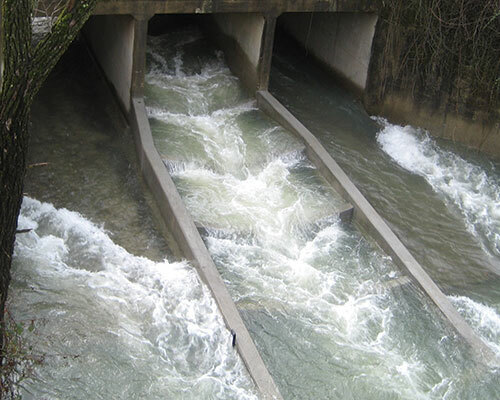 A series of weirs installed below a municipal water intake provides sufficient depth on the intake fish screen and allow for accurate gaging of in-stream bypass flows for real-time operation of pumps. 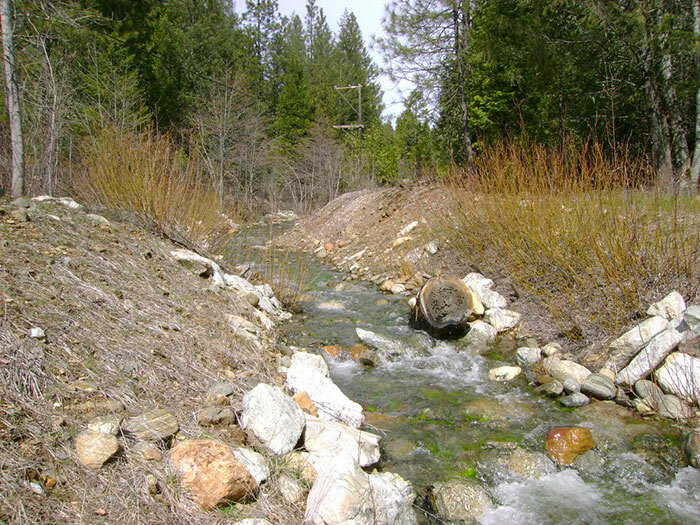 A geomorphic-based roughened channel combined with woody-debris scour structures and bioengineering bank stabilization restores channel stability and function within this historically relocated and placer-mined stream. 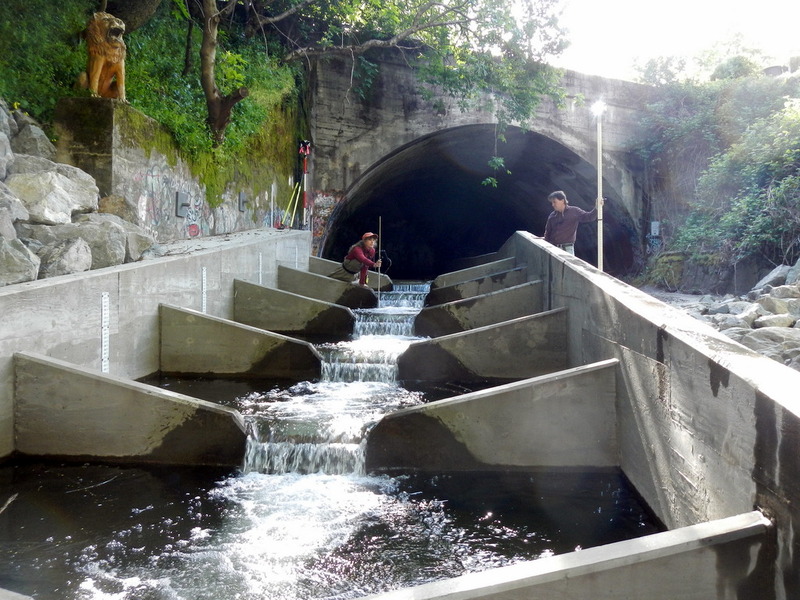 A fishway provides passage for adult and juvenile salmonids while labyrinth weir spillway gates and removable summer weir panels provide accurate flow control to avoid backwatering the upstream flow measurement weir. 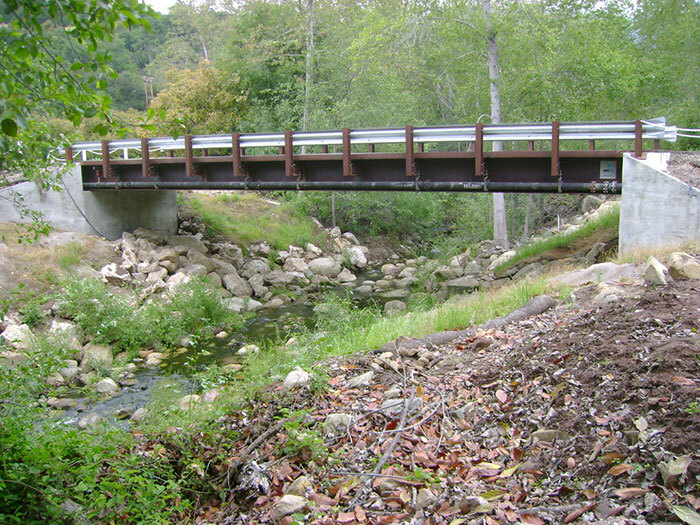 Designing bridge crossings for timberland roads to improve fish passage. 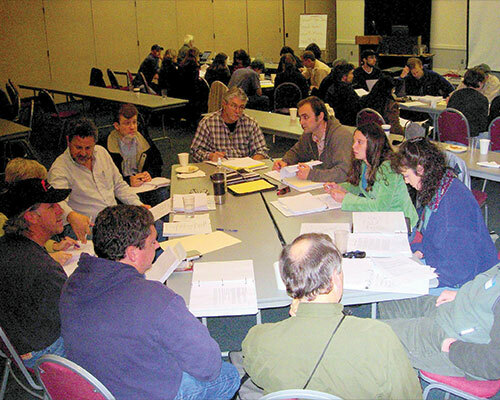 Fish passage design workshop for the Alaska Department of Fish and Game. 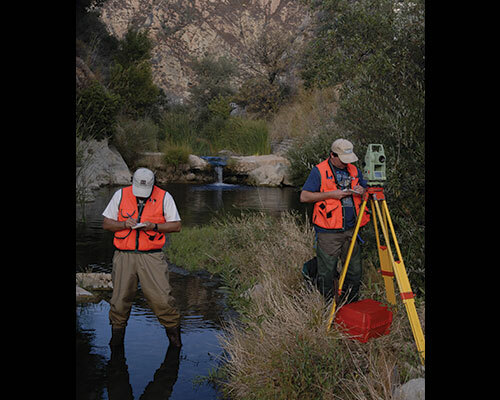 Conducting physical modeling of a nature-like roughened channel to determine optimal boulder placement for providing adult and juvenile steelhead passage at a keystone Southern California barrier. 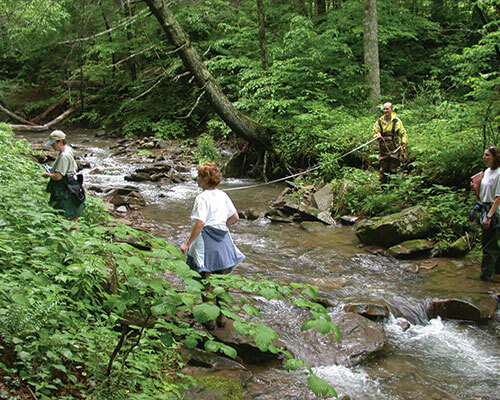 Multi-day workshops for the US Forest Service provide hands-on training in assessment and design of road-stream crossings for passage of aquatic organisms. 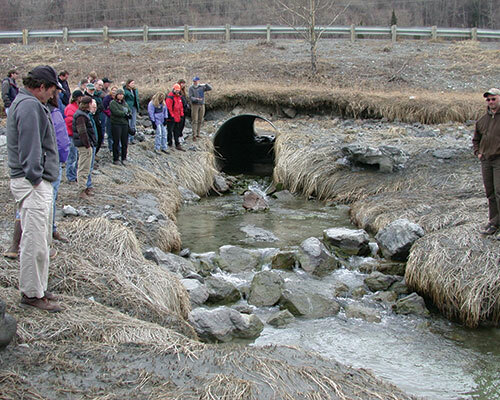 A geomorphic-based roughened channel constructed of rock and large wood protects the upstream channel from incision and resulting instability while providing fish passage. 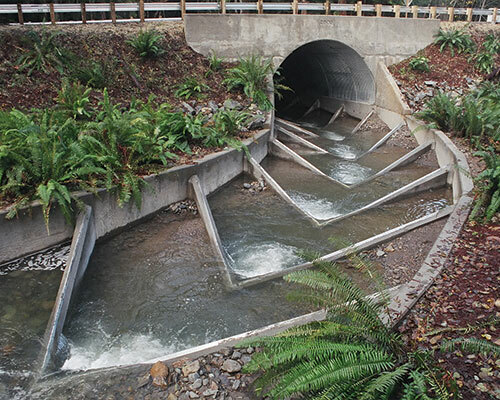 Innovative vortex-shaped fish baffles with training wall placed in a long culvert to concentrate water and debris down the center and provide migration corridors along the margins at high flow. 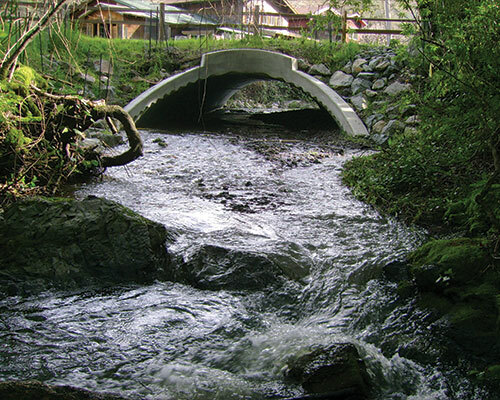 Design and hydraulic monitoring of a partial-spanning pool-and-chute fishway at a perched culvert outlet. 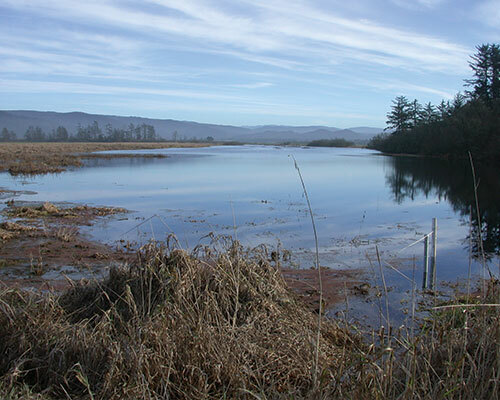 Restoring a once vast wetland ecosystem connected to the Redwood Creek estuary by constructing planting mounds to establish a spruce dominate forest to shade-out invasive reed canary grass. 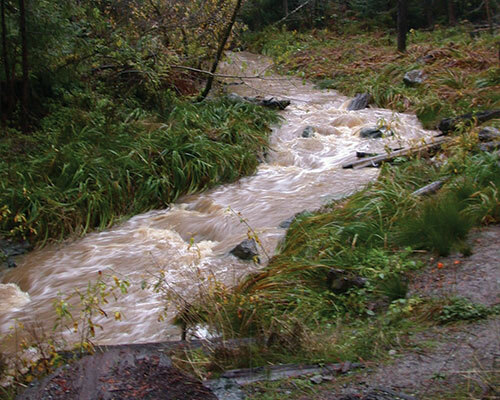 Developing alternatives for improving steelhead passage at low-water road-stream crossings. 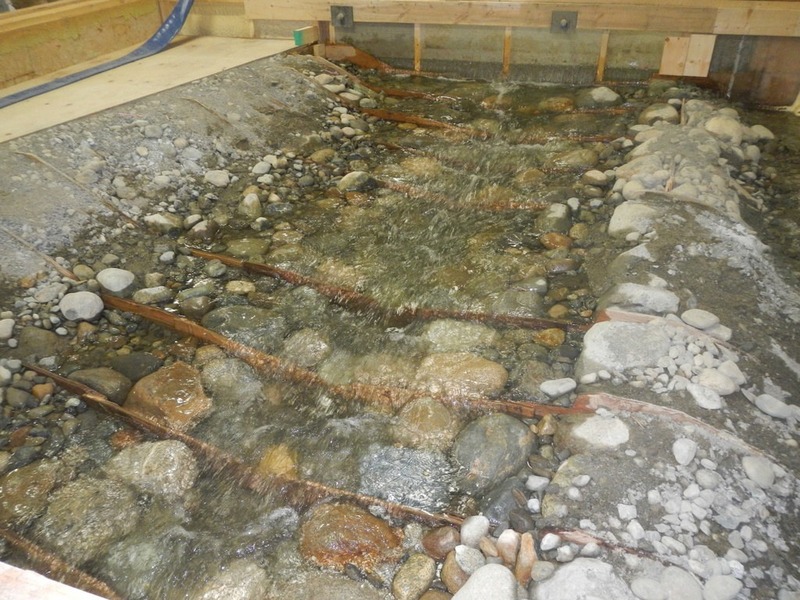 Boulder step pools installed downstream of a box culvert in an urban watershed improve fish passage and provide habitat for coho salmon, steelhead, and coastal cutthroat trout. 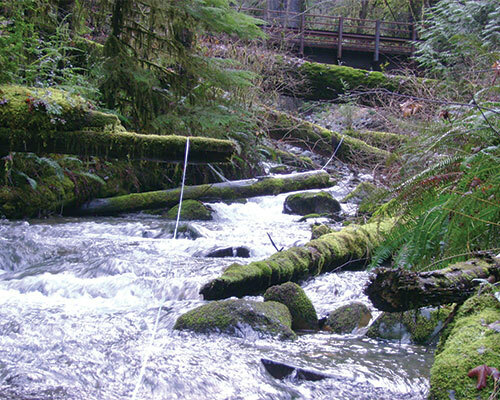 Removal of a low-water ford and installation of a channel-spanning bridge to improve passage for endangered steelhead trout. 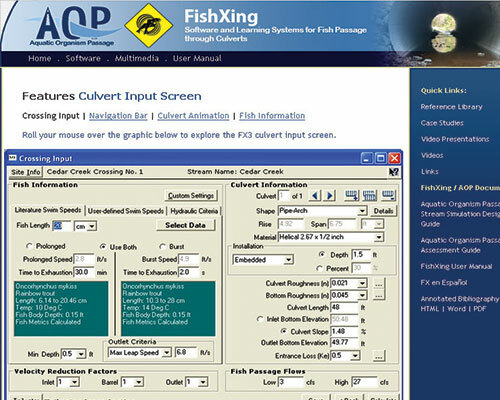 Identifying adult steelhead exhaustion barriers and evaluating effectiveness of incorporating resting pools into a concrete floodway using a population-based fish energetics model integrated with a 2D hydrodynamic model. 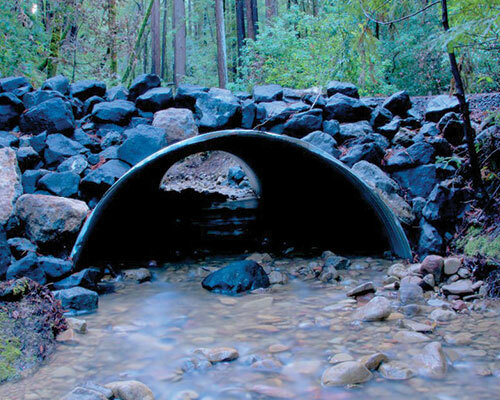 Stream simulation culvert provides aquatic organism passage in one of the most important streams for recovery of endangered Central California coho salmon. 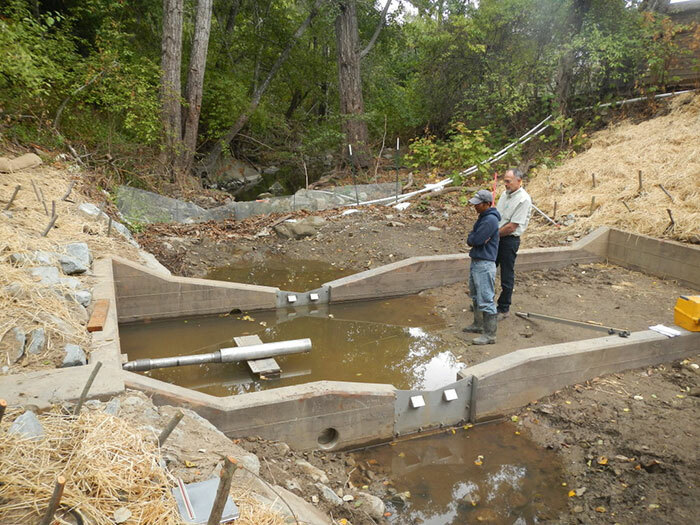 Restoring fish access and habitat in Stonybrook Creek as part of reestablishing steelhead runs to the Alameda Creek Basin. 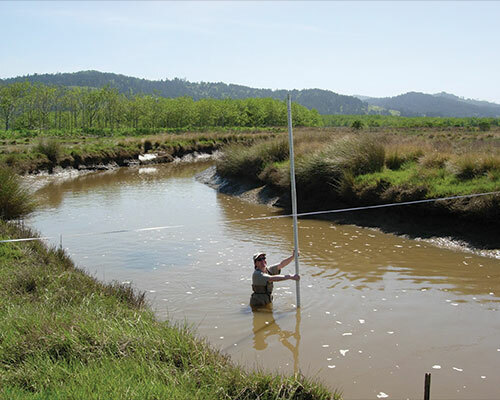 Geomorphic monitoring of a widening slough channel following construction of new self-regulating muted tide gates. 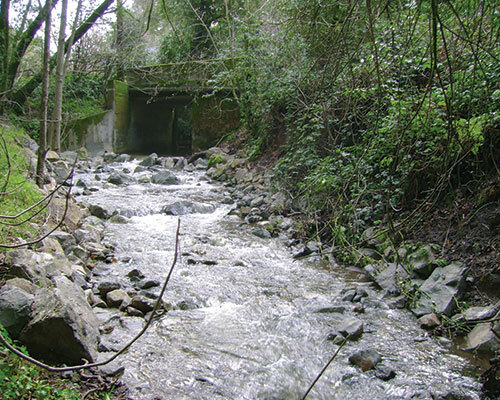 A stream simulation culvert replacement restores aquatic organism passage within this redwood forest stream in San Mateo County. 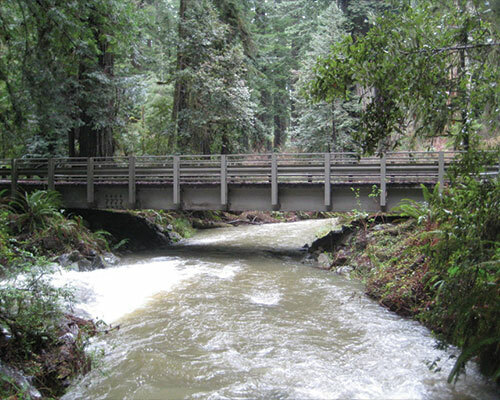 Fish passage design and assessment workshops throughout California provide engineers and fisheries biologist with tools and resources to address barriers to aquatic organisms. 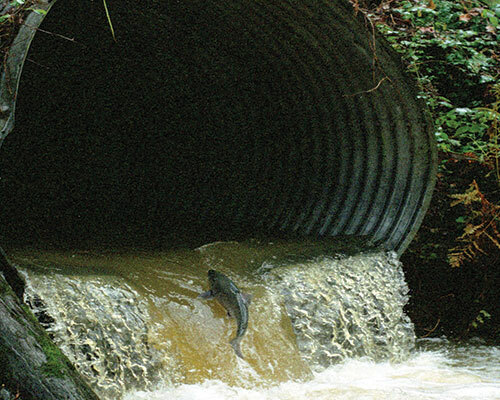 Replacement of a barrier culvert and restoration of the channel provided access to valuable spawning and rearing habitat for these coho salmon. 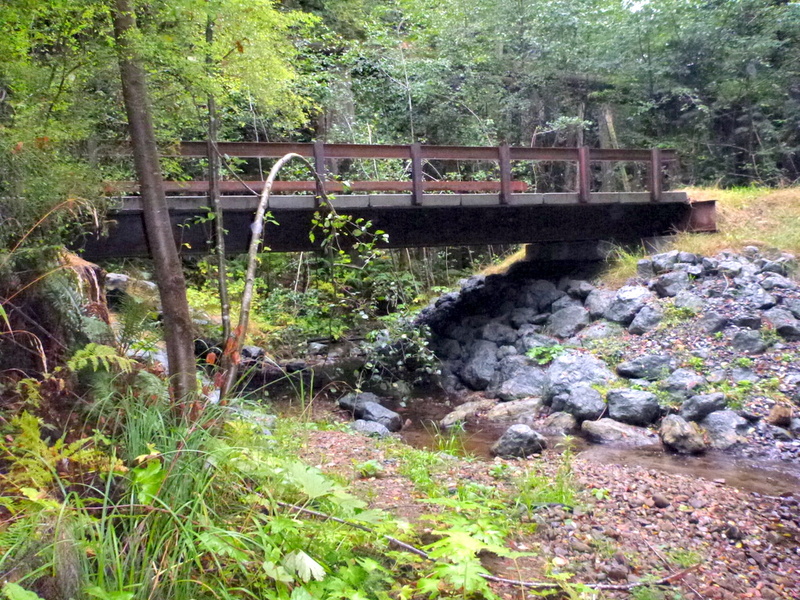 A pre-fabricated steel bridge to improve water quality and aquatic organism passage on this low gradient redwood forest stream. 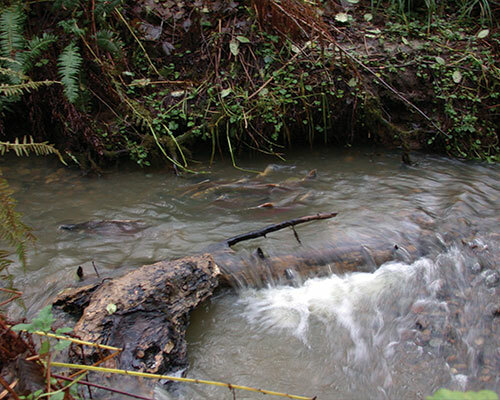 A roughened riffle creates an off-channel pond accessible to rearing coho salmon and migratory waterfowl. 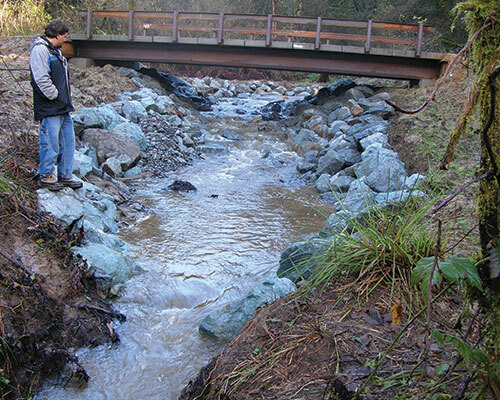 Replacing a barrier culvert with a new bridge to open up a pristine watershed to four salmonid species. 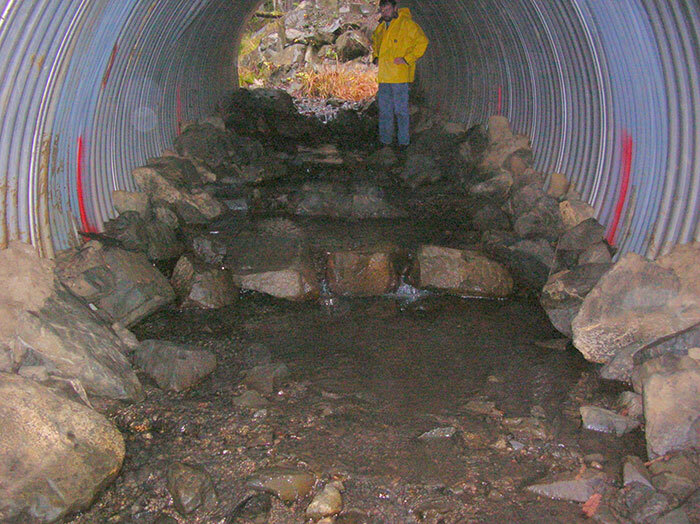 A geomorphic-based roughened channel eliminated the nearly five foot drop at this box culvert to improve upstream passage for adult and juvenile coho while providing pools for over-summering habitat. 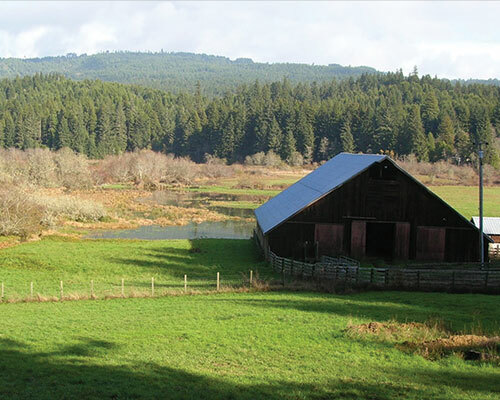 Coho, waterfowl, and ranching coexist with construction of this seasonal pond controlled by a roughened riffle and water control structure. 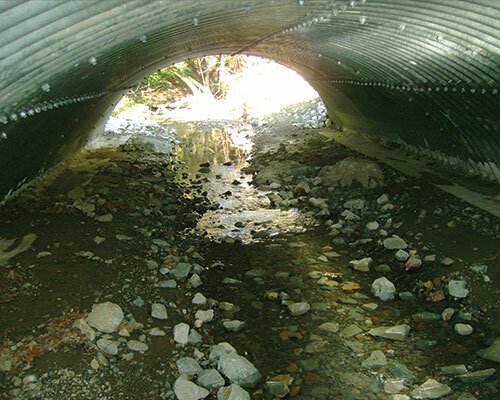 Providing aquatic organism passage using a stream simulation step-pool channel within a new corrugated metal culvert. 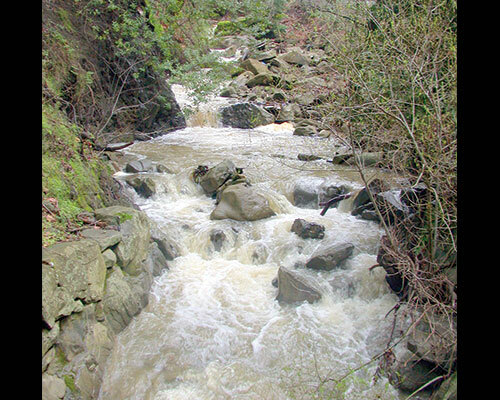 Geomorphic mapping of Gaviota Creek to identify restoration opportunities in this potential stronghold for endangered Southern California Steelhead. 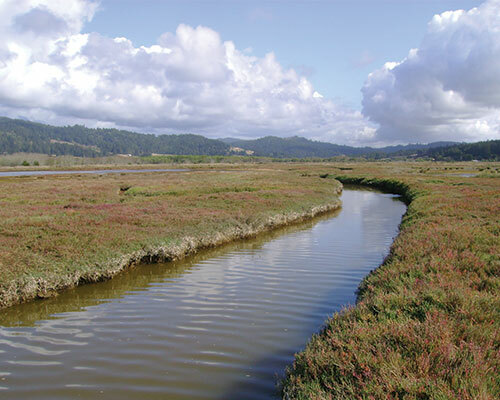 Creating a muted tidal system and constructing new slough channels, salt marsh, and backwater habitats behind existing levees to establish a functioning estuary for a variety of marine and freshwater species. 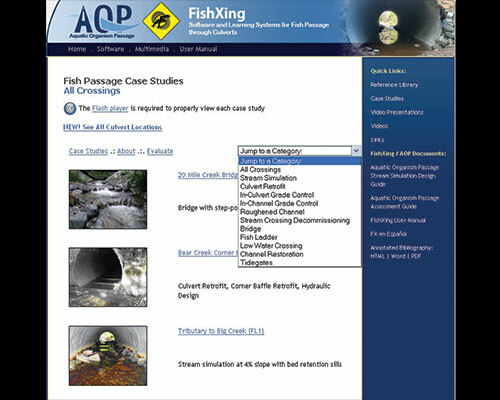 Direct observations of fish passage attempts combined with measurements of corresponding hydraulic conditions over a three-year period supported changes to the National Marine Fisheries Service passage criteria. 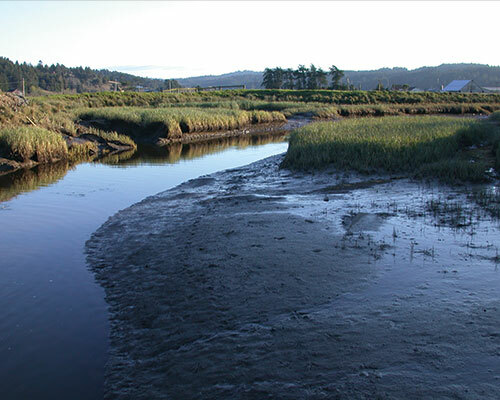 Developing restoration designs for diked tidelands to reestablish productive aquatic habitat while accommodating existing land use, including a municipal golf course and cattle pasture. 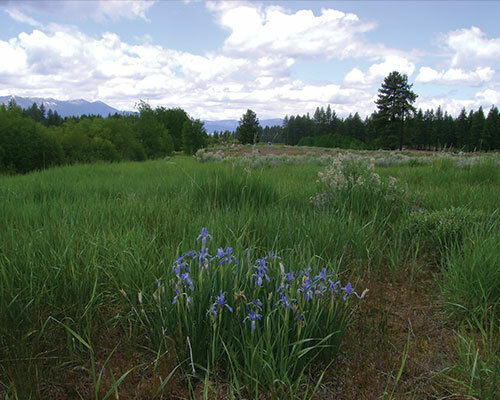 Planning restoration of a steep meadow stream to provide habitat for Lahontan cutthroat trout and protect water quality of Lake Tahoe. 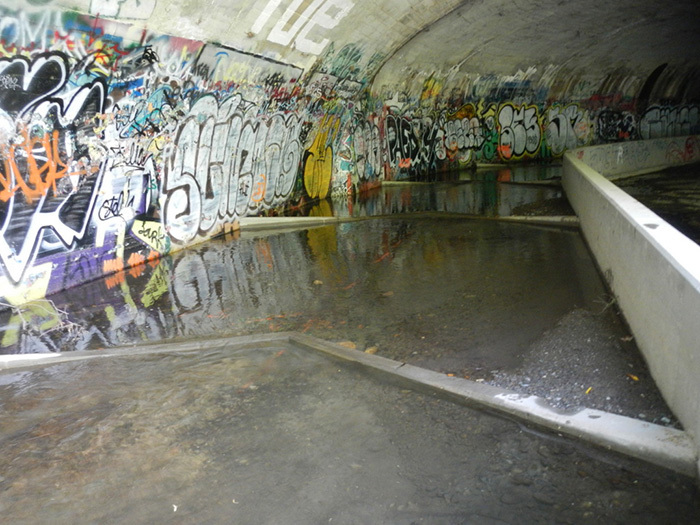 Retrofit of an existing triple-bay box culvert involved lowering the culvert floor and constructing a pool and chute fishway to provide passage for adult and juvenile steelhead trout.